December 2012 Update: We have removed all links as it seems like Fabbys has gone out of business. When you’re in a cocktail party, where standing and mingling with people is the norm rather than the exception, your feet are bound to hurt after a while, especially if they’re in 4-inch heels. That’s exactly what happened to me last Sunday. But you know what? Thankfully I had Fabbys! 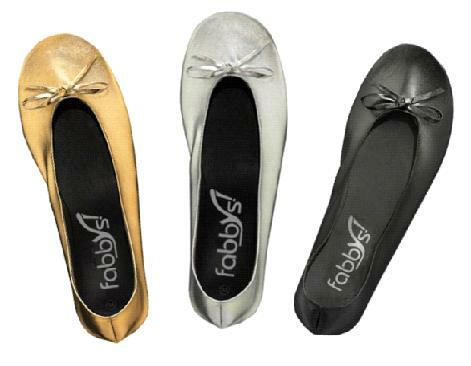 Fabbys are gorgeous rollable ballet flats that can fit in your clutch. Yes, you heard that right, the shoes are compact enough to fit in your tiny little purse! Cool, right? The idea behind it is to give high heel-loving women (that’s us!) a pair of back up shoes that are handy enough (ergo, not bulky) to bring anywhere in case your feet start to hurt from using those heels – like after a long day at work, clubbing and dancing all night, or simply when you need to rush to the next terminal to catch that connecting flight and those heeled pumps just aren’t helping. The Fabbys team was kind enough to send Your Next Shoes a pair of samples last week (thank you Fabbys!) and I was the lucky girl designated to take ’em for a test drive. And test drive I did, last Sunday. The moment I exited the cocktail party, I immediately put on the gold Fabbys and I swear, I think my feet made a huge sigh of relief. The gold looked great with my short LBD too. The samples were a little big on me even though they were size small (small fits size 6 to 7; I’m a size 5), but surprisingly they did not fall or slide off my feet. I think it’s because of the way the shoes were constructed – with the upper curling inwards for a snug fit. So off I went with the Fabbys on my feet, drove my car using it (felt better than my driving shoes by the way, and no, I did not drink at the party), picked up some takeout food with it, and went home wearing it. So here’s the deal, there is no doubt that Fabbys are comfortable. But like what the Fabbys team disclosed on their website, Fabbys are not meant to be worn like regular all-day shoes. They are not built that way. They are simply back up shoes when you need the comfort. The soles of the shoes and the upper are pretty thin. It was made this way to make rolling the flats possible. While I was wearing it, I had to make sure I didn’t step on anything sharp like a nail because I was scared that it might pierce through and cut my foot. Walking in it felt like walking on bare feet. If I walked on a cobbled pavement, I think I would have easily felt the stones. Fabbys are best for concrete ground, but I have to admit, they are indeed fabulous and very handy. Where else can you find a pair of shoes that are compact enough to bring anywhere? If you want a pair, it will only cost you an easy $20. Fabbys come in 3 colors – Glamazon Gold, Shameless Silver, and Be Jealous Black. If you buy all 3, it will only cost you $50. Each pair also comes with an extra shoe bag (for your heels), and an elastic ring that you can use to keep it rolled. With all these thoughtful extras, plus the fact that Fabbys are indeed practical, handy, and comfortable, I think I’m going to give it a good 9.8 out of 10. We will work on featuring Delicate Soles as well. Thank you for this suggestion. As for Fabbys, they actually offer free shipping for a minimum purchase of two pairs. But you’re right, Delicate Soles does have more color options. Hello Jennifer, glad you like them. It is indeed sad to know that they don’t offer bigger sizes. But try browsing through BareFootTess.com. It’s a website that offers bigger sizes for all types of shoes from different brands. You might find something you like there. These are about the same price, more color options, and even better, they donate a portion of the proceeds to Share Your Soles, a charity that gives shoes to children in need. Oh, and did I mention? No shipping! So in a way, they’re cheaper and you get to share your love of shoes with children in need.